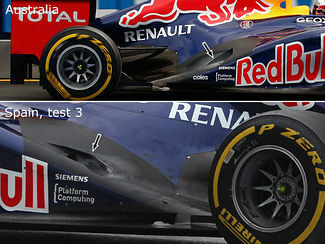 Red Bull Racing have once again come up with an exhaust and sidepod update after its drastically changed layout only debuted on the penultimate day of winter testing. This time around, the change is far less radical and a clear evolution of what was seen in the final two days at Barcelona. As Red Bull primarily changed the exhausts to get the exhaust flow down to the car's floor and immediately on top of the diffuser, it is vital for the team that they can do this as smoothly as possible in order to not lose too much blowing energy from the exhaust gases. Therefore, to further improve their design, the exhausts are now covered deeper in the bodywork, relying more on exhaust channeling from the carbon fibre bodywork that sits behind it. With the channel now longer and deeper, exhaust gases can be kept together longer, and especially better directed towards the diffuser and floor. It is clear from burn marks that the exhaust is flowing primarily over the tapering edge of the sidepod, but exact flow is likely to be vastly different in relation to the traveling speed of the car itself. Either way, the benefit of exhaust gases aside and above the diffuser as of such importance, that more updates are likely to appear in the next few races as well. Another surprise from the f1 guys! These machines are built to perfection. Really! High tech technology involves the new exhaust design, as well as the brake cooling hub caps, and a lot to mention. No one expected that these things will come. 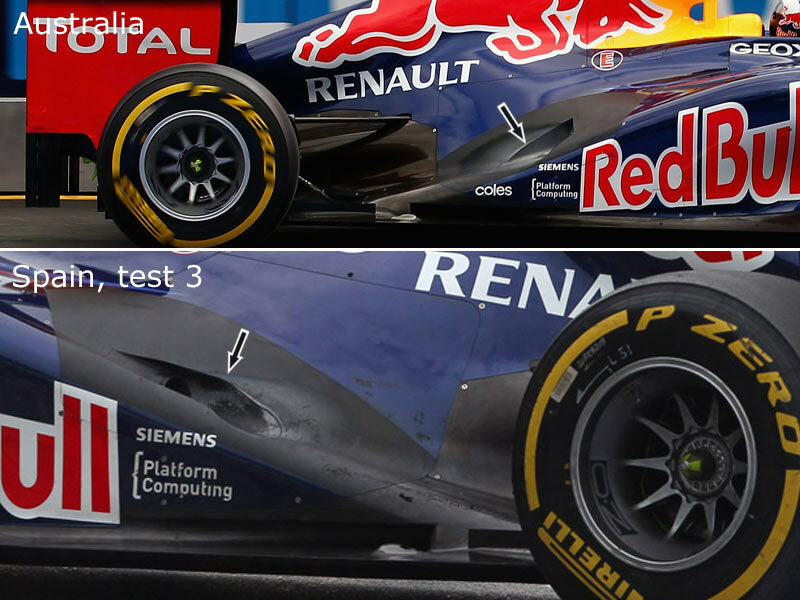 F1 is a good example of technology and craftsmanship. the main problem would only be repairing these things. It's probably harder to fix high tech cars rather than just normal cars.